This Kichler Halleron 3 light flush outdoor porch lantern in Londonderry finish with seeded glass panels is rated IP44 and boasts classic Victorian style. Detailed ceiling mount and 30.5cm half round lantern, with clear, curved seeded glass panels and three-lights inside. The lantern features curved vertical ribs and lower finial, with rectangular detail to the mount that creates a beautiful effect. A lovely flush outdoor light that is suitable for any exterior porch in a period or traditional setting. Unique shapes and patterns are the highlight of the Halleron Collection. The clean traditional design reflects its Victorian era inspiration and the Londonderry finish and seeded glass panels create the perfect fit for any home. Constructed from steel and glass, this exterior light will give many years of service without losing its good looks. 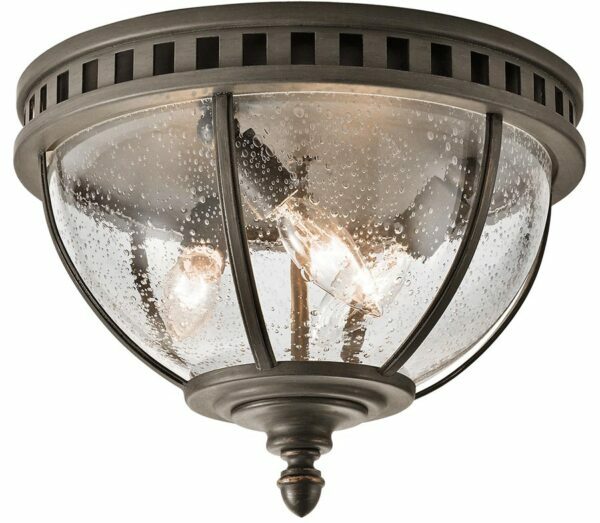 If you are searching for quality lighting in a unique style, this outside porch light should be considered. Fully weatherproof and supplied with a manufacturer’s 3-year anti corrosion warranty, which relates to the corrosion of finishes on exterior lights like this one. Locations within 5 miles of the coast are excluded. Exterior fittings must have an IP (Ingress Protection) rating which indicates the fittings ability to prevent solids and liquids penetrating the enclosure. The higher the number, the greater the protection. The minimum rating for an outside light exposed to the weather is IP23. This outside light is rated IP44 and can also be used in bathrooms. There are matching fittings in the Halleron outdoor range that includes a 3-light chain lantern, small and medium wall lanterns and a pedestal lantern; please see below. This exterior light is supplied by Elstead Lighting and designed in the USA by Kichler who were founded in 1938. They design beautiful home lighting products featuring award-winning craftsmanship and unparalleled quality, such as the Halleron 3 light flush outdoor porch lantern in Londonderry finish with seeded glass panels and rated IP44 you see here.